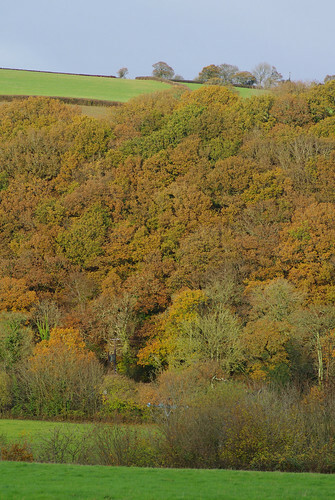 Bridford Wood is situated right opposite the more popular Dunsford Wood (one of Devon Wildlife Trust's flagship reserves.) 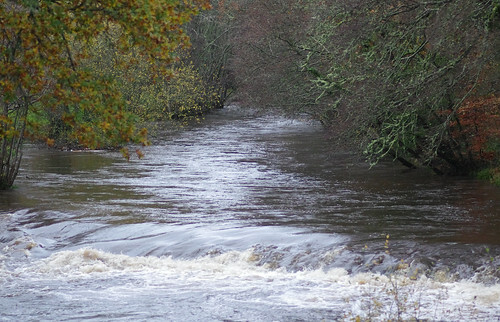 Over the years, we have visited Dunsford a number of times, following the River Teign upstream. But though we have stood on Steps Bridge and looked down at the racing river, we have never elected to follow its course in the other, more natural direction. Today, the temptation proved too strong to resist. 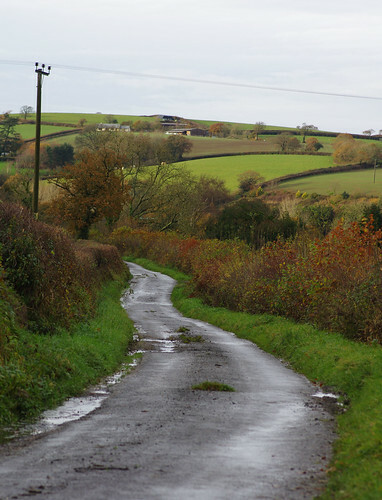 After disembarking at the car park after a shower, we crossed the road and entered Bridford, well into the afternoon, and conscious that time was not on our side. The camera was turned on and promptly showed one bar on the battery indicator (not a very encouraging sign.) I checked my jacket pocket for the spare but the spare wasn't there. I speculated gloomily that it could be one of those days. 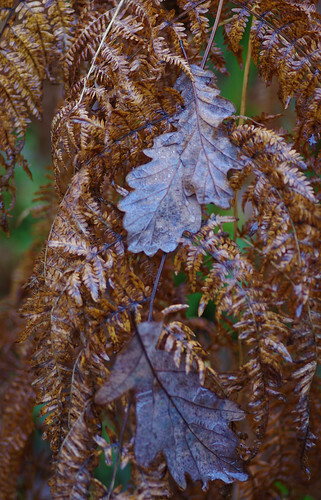 There were ferns among the russet leaf litter with brown hairs on the stem at neat intervals. 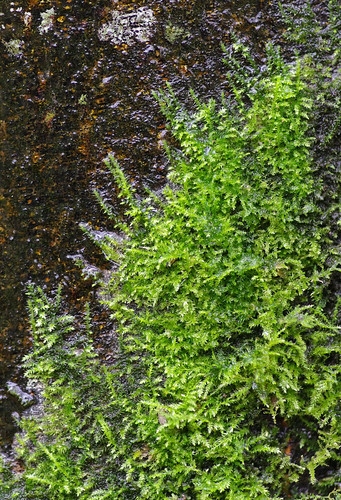 Mosses provided competing islands of green and the strange, abstract forms of the aptly-named Candlesnuff Fungus were on fallen logs. Some examples were singularly stemmed, others had deformed, ashen, three-fingered hands. Imploring hands, you might say. The camera was turned off and back on again in short bursts but a clear, decisive capture proved elsuive. Or at least that's what I think this could be. There is so much variation of this species in books and online that my conviction is more of a hunch than anything else. The creeping tendrils at the edges almost give a sense of movement. The focal length of the macro lens does not really lend itself to landscapes. By focusing on the background, the foreground is blurred considerably. But I quite like the effect in the shot above. It was cropped from the bottom up to reduce the blurred area a bit. Somehow the end result conveys the possibility of getting lost. And though I have a map in hand that possibility was still a valid one. Especially when we were heading to its eastern extremity, over the edge of the charted world. There were strange shapes everywhere. This wood seems to have been claimed by things we hadn't seen before. 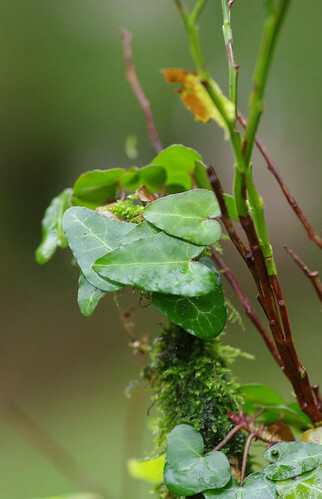 These leaves were entwined around bilberry stalks and a moss-covered branch. They were possibly a cultivated form of ivy. To our left, there was a fence and a property beyond it. Further round we saw two pigs in a fenced enclousre. A slightly grainy, high iso shot but there is still enough detail on the gall to be perfectly usable. Cherry Galls are commonly found on the underside of oak leaves, hence the quercusfolii part of their Latin name. 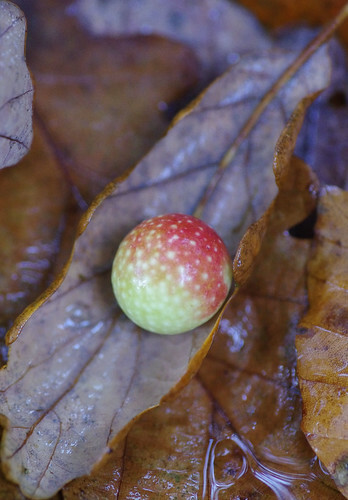 Apple Galls are also found on oaks but usually on twigs and branches. The soft, silvery sheen against the rusty bracken would not look out of place on a Christmas garland. 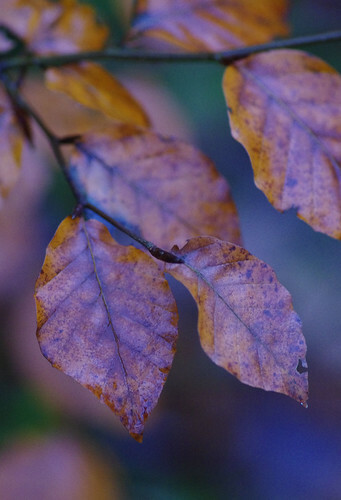 The leaves of the tree have stalks even though sessile means stalkless. It is the stalkless acorns which give this tree its name, distinguishing it from the stalked acorns of English (also known as Pedunculate) Oaks. 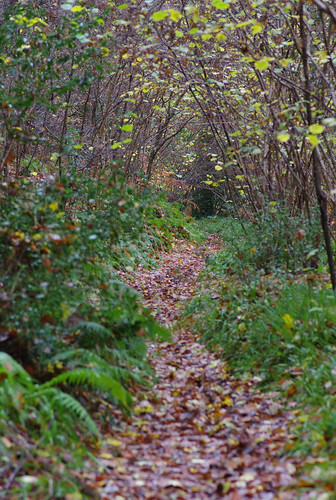 At this stage we had left the wood behind and were wandering along a track. 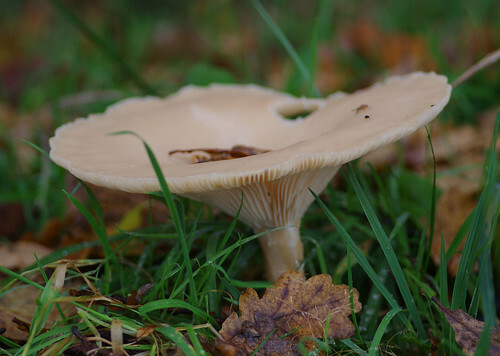 These fungi were just off to the side along the grass. There was a small group of them. 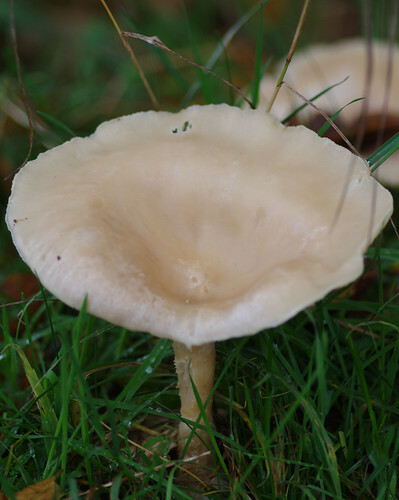 Trooping Funnels are relatively common. The Trooping part of their name comes from their occasional habit of being found in a line, like soldiers standing to attention. It could be anywhere but there was something about that corner which invited us to go beyond it. We proceeded as far as a lane junction and decided to double back. Clearly there hadn't been a cold snap yet in the Teign Valley. 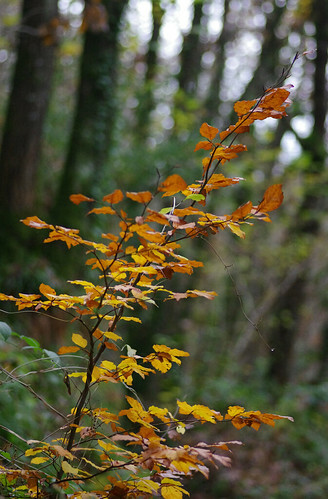 Lots of trees still had full crowns of leaves, albeit leaves of fading hue. From a distance, their outlines looked like clusters of broccoli florets past their best. Against a backdrop of serenity our senses were bombarded by a sonic assault. Earlier I had seen the raging river carry the huge base of a trunk as if it were nothing more substantial than a cork. On the way back we heard an explosive crash and splash below us. It could only have been a tree falling into the river. Looking downstream at the swollen River Teign from Steps Bridge. And here is the evidence. Many of the trees were partly underwater. Over time, if this period of relentless rain persists, more leaning trunks might be prized from the ground and carried away. Nothing is immune from the elemental forces, after all.